Weather- mild temps in the 40's. Prior to this particular excursion we were unable to accrue a significant amount of research on these buildings. I was frustrated with the lack of prior information because I believe that most paranormal activity is probably linked to the history of the location. There were about 15 other individuals that showed up for this investigation at the ostentatious Macoupin County Courthouse around 8 that night. We were met by Loren Hamilton and Kelly Davis representatives of the American Ghost Society and they gave us a brief history of the building. Since there were so many of us, they broke us up into small groups for the initial walk-through. In addition to the courthouse, we were also allowed access to the historic Macoupin County Jail, circa 1869. It is hard to believe that building was still being used until 1988. Having attended Blackburn College during the 1980's, I felt grateful that I never got caught doing anything that could have landed me in that historic, yet horrific place! After the initial tour, Zach and I separated from Wayne and Hank allowing us to cover as much ground as possible in the short period of time we had left. For some reason I found the attic (records areas) of the courthouse to be one of the creepiest. I can only imagine the difficulty they have getting their employees to go up there to collect records, even during daylight hours. Zach and I were fortunate enough to wander up there before they shut the area down to investigators. On the second floor of the courthouse, we found an area that was garnering high EMF readings in the middle of the hallway. Many investigators seemed enthralled with this area, however when we were down to the basement we discovered a number of large electrical lines that ran under that floor, suggesting it was most likely not a paranormal phenomenon. This is common in historic buildings that are retrofitted with electrical services. While walking through the courthouse, Wayne and Hank captured several intriguing EVPs, almost as though something was following them. One in particular occurred twice, several minutes apart in different locations. I am not exactly certain what it says, but it sounds to me like "say graves". I have included this recording below. 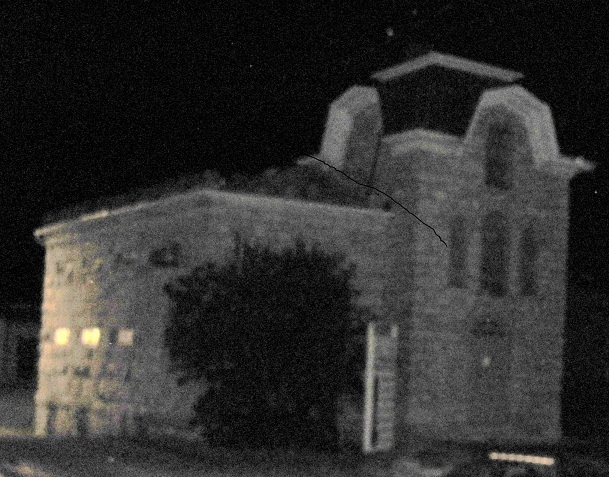 Wayne also captured a very interesting picture in the Old Jail, (below). What we like about this photograph is that the shot taken right before does not have the black shadow in it. We have not figured out what may have caused the shadow. That evening none of our team had any personal experiences but are glad we got the opportunity to investigate the historic buildings. There is money being raised to help save these old buildings, and tours are available. The whole Carlinville area has many places purported to have activity such as the old Looms House on the picturesque town square. We plan on returning to this area hoping to capture additional evidence and gain further insight as to what may be going on there. An interesting "free" 2 seconds in, then a strange,creepy voice, about 10 seconds after Wayne says we need to get our stuff.